When Bubba’s Hover, the viral video of Bubba Watson’s BW1 hovercraft golf cart manufactured by Neoteric, captured massive world attention in April you may have thought it was just another passing fancy. Not so! 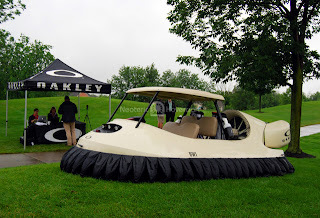 The attention lives on and the vehicle dubbed “the coolest thing to hit the golf course” has now hit the road. Oakley, who commissioned the craft, has Bubba’s Hover on tour – not only attracting attention but also contributing to the greater good. 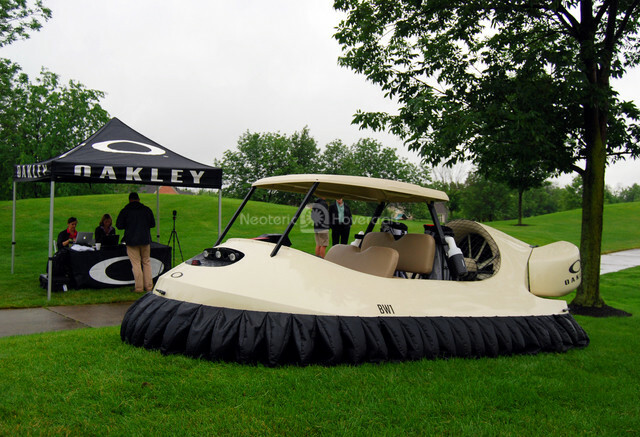 From Pennsylvania, Bubba’s Hover moved on to Ohio, where Oakley held a charity event at two Cincinnati area golf courses - the Heritage Club in Mason and Four Bridges Country Club in Liberty Township. 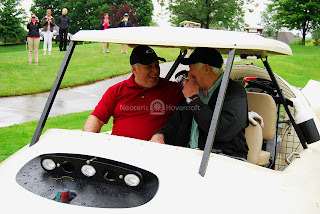 The event was designed to raise funds for OneSight, a Luxottica Group Foundation dedicated to restoring and preserving clear vision for the hundreds of millions of adults and children in need who can’t afford basic eye care. Oakley is a division of Italy-based Luxottica. 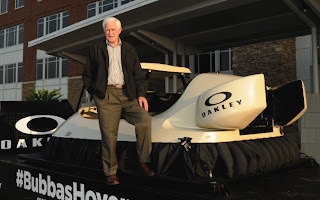 At each course, Chris Fitzgerald gave the winner of a round of golf and the highest donor to OneSight, along with their guests, a joyride in Bubba's Hover. The BW1 awaits the next joyride at the Heritage Club in Mason, Ohio. 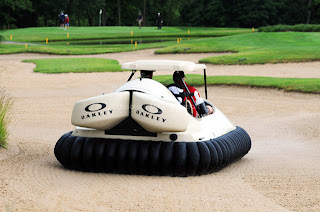 Sand traps or water, Bubba's BW1 simply hovers the hazards. Lights, camera, action! 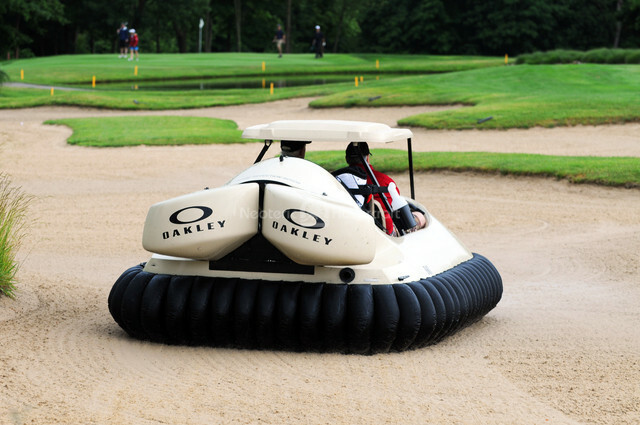 Bubba's Hover attracts attention wherever it appears. At Four Bridges Country Club, golfers check out Bubba's Hover. 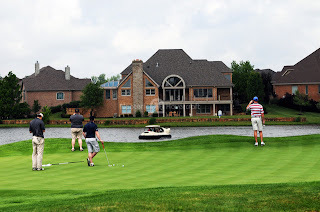 to Four Bridges Country Club for the second attraction in Oakley's charity event. golfers to get involved in the charity event. 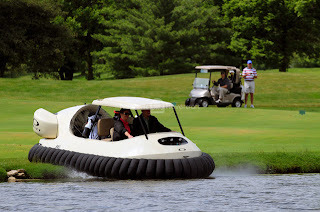 As an Internet celebrity, Bubba’s Hover definitely attracts major attention wherever it goes. 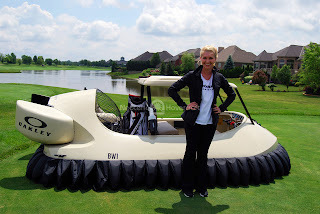 The unique and captivating nature of a hovercraft golf cart makes it the perfect tool to boost participation in charity events, golf tournaments, country club and golf course grand openings – or just about any special event imaginable! 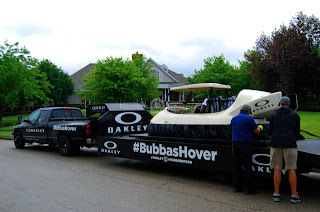 After wowing the crowds in Pennsylvania and Ohio, Bubba's Hover won't be languishing in a hangar any time soon. Right now the craft is at Neoteric's headquarters in Terre Haute, Indiana, undergoing some cleanup and standard maintenance, after which it will travel to Rhode Island to meet Bubba Watson at the 2013 CVS Caremark Charity Classic June 24-25 at the Rhode Island Country Club in Barrington. After that? Stay tuned and we'll keep you updated!